It could be YOU….. Brentford reveal wonderful opportunity for one family and one fan. Well here’s something that doesn’t come around very often. By which we mean, ever. A money can’t buy opportunity and the chance to write yourself into Brentford FC history. The club announced yesterday that with the Lionel Road ground breaking ceremony due to take place on March 19th, one family will be given the opportunity to plant the first, historic shovel into the ground and, thus, officially, commence the digging work on construction of our new home. The club are looking for a family with a special Brentford story and are asking you to tell them why yours deserves this place in Brentford’s history. How far back does your family history of supporting The Bees go? What lengths does your family go to in following Brentford? How many generations attend matches together? ( I make no apologies, I’ve lifted direct from the official site there to get to the meat of this one). The full details are available on the website now and you’ve just under two weeks to get your entries in. There’s a hashtag, too – #ForeverBrentford . So what are you waiting for? Put simply, this is incredible. What a gesture and a world away from the usual photo op seen in such circumstances of the Chairman leaning on a shovel in a high viz jacket and hard hat. Then again, this level of supporter and community interaction is what we’re all about and what Brentford have been doing for years. Putting the supporters and putting the family at the heart of it all. Certainly, something I’ve been discovering more and more as my own has grown. But wait, there’s more. Not only are the club looking for a special Brentford family but there’s a chance for ANY fan to be involved. Both in terms of attending the ceremony aswell as then being given one of the special ground breaking shovels being used for the event. The same website article has details of the draw which will see one other supporter being given the chance to attend. There’s nothing more complex to do than add your fan number, details and then hope the luck of the draw is on your side. I love this club. What a way to embrace the fans. Although, by the same virtue, I’m still hoping we also get to to see Matthew Benham, Cliff Crown, Mark Devlin et al lined up in their hard hats. It wouldn’t be a new stadium without it. King Kev the Eighth. Will you be a part of history on Saturday? Kevin O’Connor. Is there nothing he can’t do? With Brentford approaching our 4,000th league game this Saturday, the home encounter with Barnsley, many of us just coming in from work last night (or who had been home in the morning) would have received a letter from the great man himself. We all know Kevin as Mr. Brentford. A ‘one club’ man who made 501 appearances between January 2000 and August 2014. A man who is fourth in the club’s all time appearance list(behind Ken Coote, Jamie Bates and Peter Gelson). A man who is still with the club, as B Team Head Coach. This, having taken up the role after Flemming Pedersen left during the week to take over as Technical Director of FC Nordsjælland in Denmark. He’s done just about everything at Griffin Park, short of taking the microphone from Peter Gilham to announce Scott Hogan as a goalscorer – sponsored by Siracusa. It’s a little Italian restaurant by Brentford lock. And that, I would pay good money to hear. But in addition to all of this, Kevin clearly holds sway as a club figurehead. And rightly so. Certainly one of the nicest footballers I’ve had the pleasure to meet, something that can’t be a unique feeling to yours truly. So it was a timely reminder, if one were needed, to receive the letter telling us that you can still buy tickets for Saturday’s 4,000th with Barnsley. More to the point, that Season Ticket holders can pick up extras for just £10 each via the online ticket site. If you’re reading this and know somebody who might want to come along, it’s £10. £10. Ten pounds. That’s not even three pints these days. For the chance to see Brentford make another thrust for the play-offs. For the chance to be a part of history and say “I was there” for game 4,000. 4,000. Just to put that into context, it means Kevin (and Peter Gelson, who will also be in attendance) have both played in pretty much an eighth of our entire history. A quarter of every Brentford league game, ever, between them. To quote one regular correspondent, RebelBee: “Saturday is huge, both for the occasion and the chance to move into the play off places. It’s another tough game and we need to fill GP and give the same vocal support we’ve seen on the road this past few days”. And if that wasn’t enough to tempt you, don’t forget that singer Annelies (who has already sung ‘Hey, Jude, prior to the 4-1 demolition of Reading) will be back at Griffin Park. As ‘official’ tell us, “ The Voice contestant and University of West London student performed ‘Hey Jude’ pre-match before our win against Reading last month and now returns for our half-time show against Barnsley on Saturday 22 October. Tweet us your requests at BrentfordFC and she’ll choose the best two”. I can’t believe I’ve missed that one and, surely, it is now too late? Or is it? I’d love to hear her covering The Quo. As if Saturday isn’t going to be special enough already…. Annelies was at Griffin Park for the Reading game. Game on. We’re back to match day at Griffin Park with Brentford looking to make it four wins in a row when we welcome Bristol City on Saturday afternoon. Elsewhere in the Championship, we’ll also take a very brief look at last night’s result where Brighton’s thrashing of Fulham gives Big Bee Radio the chance to score some cheap points before 3pm. And, of course, Kitman Bob Oteng has the final BBGiveaway of the campaign – not Alan McCormack’s black pants (I’ve seen them requested) but something very special. First up though, Bristol City. Let me take you back to the summer…. The pitch had collapsed, Marinus was in charge, Andreas Bjelland had suffered that horrendous injury in the Oxford United fiasco, Andre Gray was just about still a Bee whilst Stuart Dallas, Moses Odubajo and Will Grigg had all departed for 7(seven) figure sums. Jonathan Douglas too, for nothing. Yet despite all this, our opening away game of the League campaign saw the Bees beat Bristol City 4-2 and make it 4 points out of 6. Might we actually get away with the sales and parting company with Mark Warburton over the summer? Could this be a continuation of form rather than a longer term remodelling exercise under the much maligned ’statistical model’? ‘No’ was the subsequent and emphatic answer. Andre’s goal was his last in the red and white stripes before the inevitable sale to Burnley took place whilst Marinus was gone by the middle of September as performances and form took a sharp downturn. But we mention this just to show how things can change. Bristol City away, whilst only two games in, marks a point where I really thought we might have the potential to match the incredible heights of last season. We were third in the fledgling table with only Brighton and Middlesbrough above us (and look where they are now). It was a psychological high point before it all came back down to earth with a bump. Lee Carsley returned some much needed confidence and pride to the Bees as this team found their feet. His decision to step away was sad, though respected, and Dean Smith has come in since that point. A positive beginning (oh, those Ryan Woods and Sergi Canos goals at Reading) saw that awful run at the start of 2016, not to mention the additional challenge of dealing with the Tarkowski affair. Despite this, recent form has restored a lot of the Buzz around Griffin Park. We are safe in the Championship for a third successive season as a result of those 9 points and 9 goals from our last three games. Lasse Vibe has found his scoring boots to shoot up the Championship charts whilst the Bees are within three points of the Loftus Road mob – with a game in hand (at Hull). Can we make it 4 in a row today? Will the Bees make it a pair of Bristol’s ? 6 points and a double would be a rare achievement in this most up and down of campaigns. How will we go without Alan Judge? Does Nico Yennaris, reinvented as a goal scoring midfielder, walk back into the team? Has John Swift’s gash healed? Questions, questions questions! As ever, I can’t answer them. I can make an educated guess of: Yes, yes, we’ll cope today (although it will be sadly), yes and ‘it’s irrelevant as he won’t start’. However, I’m just the numpty on the terrace so don’t take any notice of any prediction from these quarters. Instead, here’s to 3pm when we find out. View from the Braemar – how will the Bees go without Alan Judge? Ok – Fulham. There were tears in the Bruzon household last night. Of laughter. These, as they went down 5-0 to promotion chasing Brighton. The top of the table remains of supreme interest as Middlesbrough, Burnley and the Seagulls continue to match each other blow for blow. If you you thought the final day last time out was tense, this could really match it with Boro’ hosting Brighton in the final game of the season. Good luck to them. I’m more concerned with matters at Griffin Park. Our one decent hashtag is back today – #BeeTheDJ. Just contact @BrentfordFC on twitter with your choice of pre-match music. If you are lucky, you’ll get to hear it played before kick off. Could I ask for this – one of the greatest TV theme tunes of all time. In honour of our West London rivals. Failing that, how about we just pick it for our ‘walkout’ music on April 30th…. And finally, Kitman Bob is back. It’s his final BBGIVEAWAY of the season. Despite the highs and lows we’ve experienced onfield this campaign, our kitman’s twitter competitions have provided a constant source of enjoyment and genuine pleasure to supporters. What other club would do this for their fans? It’s easy to criticise when things go wrong but absolute kudos to all the team behind the team for all the great work they do. And these competitions have been right up there. Not just the prizes but Bob’s interaction with the fans, too. So what do we have today? Well, at the time of writing it remains a mystery. All we have to go on so far is Bob’s promise that its going to be special. For the last time this time around, get following and get predicting from 8am. Enjoy. And Bob, thank you ! Different record. Same tune. Is Sammy the new Figo? That was the sweet sound ringing around Griffin Park after Brentford swept aside Swindon Town yesterday. It was a performance, second half especially, that made victory by a single goal seem much closer than it actually was. Moreso, it meant Brentford topped League One until the wins by Wolves (seemed comfortable, on paper, for the Molineux men) and Leyton Orient (the late, late breakfast show) had been registered. However, with the gap remaining thinner than Mark Warburton’s hairline, and Brentford now having picked up 31 points from a possible 33, the next game really cannot come soon enough. Brentford supporters were treated to the sight of a new mascot at the start of last season, in the magnificent Buzzette. 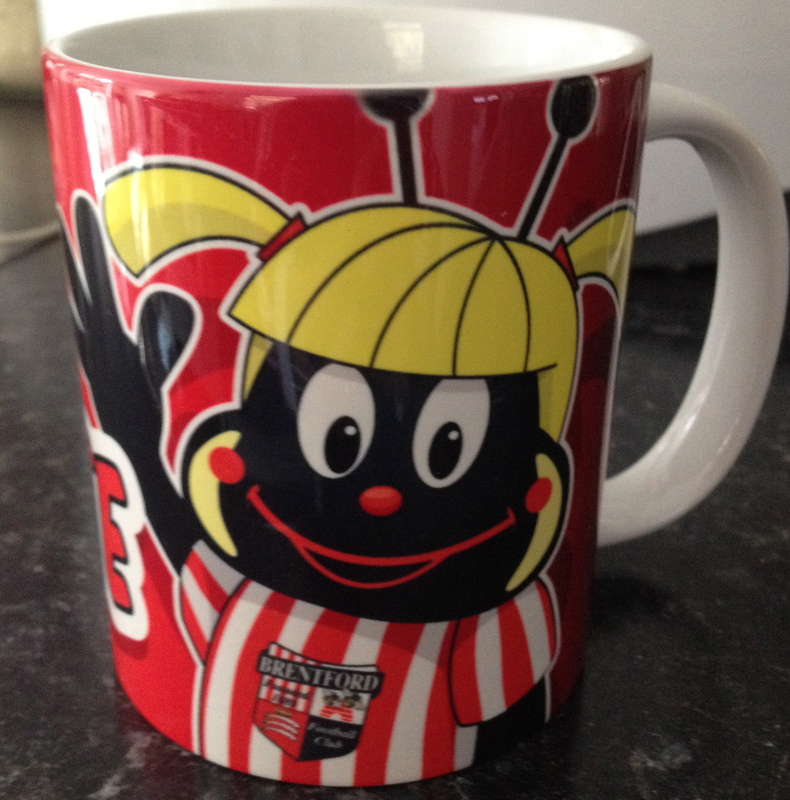 An immediate fan favourite, she has gone on to adorn her very own ‘mug’ and you can win one below. 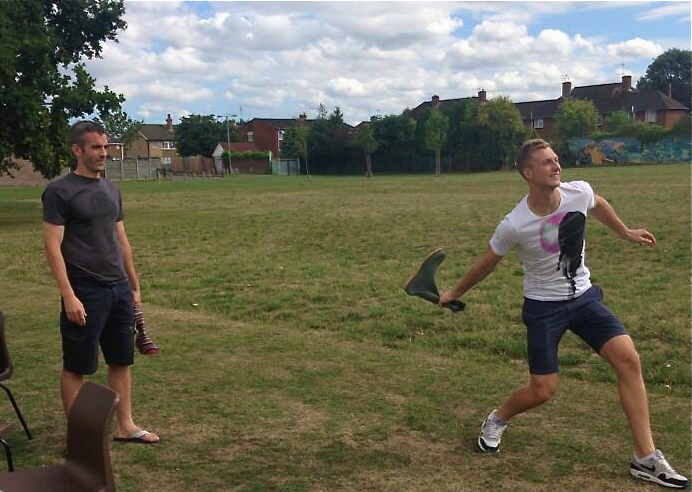 Yes, it’s the return of the ‘Last Word Caption Competition’, which will be judged by none other than Natalie Sawyer. Can you beat our previous winner, Iain Roswell? (below). Can you come up with a caption that doesn’t involve ‘rock, paper, scissors’? Can you come up with a funnier comment that does involve ‘rock, paper, scissors’? The entries have now started to reach ‘Last Word Towers’ and the competition closes on Friday 1st November at midnight. You can enter HERE by adding your comment to the picture of Farid and Fergie. The Last Word will return in full, shortly. In the meantime get those thinking caps on and, if you can make Natalie laugh, then you could win your very Buzzette mug.